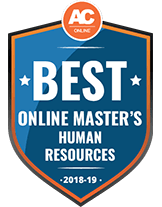 What are the Best Online Master’s in HR Programs of 2018? What Can I Learn in an Online Master’s in Human Resources Program? What Can I do with a Master’s in Human Resources Degree? How Much Can I Make with a Career in Human Resources? Human resources, or HR, continues to be an in-demand career field as new businesses form and existing startups grow their operations both domestically and globally. Organizations across all industries, including corporations, nonprofits and government agencies, need highly skilled human resource experts who can ensure that they adhere to today’s complex and constantly changing employment laws. An excellent way to enhance your skillset and advance in your career is to earn an online master’s degree in HR. Find out what this type of degree program covers and which schools offer the best online HR master’s degree programs. Take a look at our rankings below to see which one of the top-ranking master’s degree programs in HR would suit you best. For these rankings, we obtained our data from the United States Department of Education, the Integrated Postsecondary Education Data System and the universities’ own published materials. All of the schools in our list are accredited. With an impressive employment rate and low student to faculty ratio, Fontbonne University is a promising option for students who want a personalized education that leads to a positive career outlook. While Fontbonne doesn't have a program strictly for human resources, its Master of Management and Leadership gives students the skills and knowledge to manage both people and projects. The program is available in a hybrid format, so students will be required to take at least half of their courses on-campus. Each course is offered in 8-week periods and a total of 31 credits are required to graduate. This consists of 10 courses related to management, human resources and organizational leadership, as well as a capstone course. There are concentrations available through this program, although they will require an additional 12-18 credits. Because Fontbonne charges a flat rate per credit for tuition, choosing a concentration would mean increasing the time and cost it takes to earn the degree. Transfer students can bring in up to 6 credits for the program, although the standards for accepting transfer credits are strict. On average, students can expect to finish this degree in 18-24 months. Prior to applying to the master's program, students will need to have earned a bachelor's degree from an accredited institution with a minimum cumulative GPA of 2.5. Work experience is not required for admission, but students should submit a resume to show their previous experience. Saint Leo University is a private Catholic school with over 13,000 students. It offers a Master of Business Administration with a Human Resource Management Specialization specifically for online learners. In this program, you will acquire the skills to handle management positions in the HR field and work effectively in changing business environments. Focusing on current issues and challenges in the field, this curriculum will help you learn foundation theories and methods and apply them in modern business contexts. Employee training, selection, compensation and legal issues take precedence as the main topics of study. After completing the 36 required credit hours, graduates can explain and enforce effective HR practices while following practical and ethical guidelines. They will also have expert-level knowledge of employment laws and be able to articulate their importance and function in HR scenarios. Saint Leo MBA students may take an optional 3-credit internship to supplement their core curriculum. The internship can consist of a full- or part-time job in the HR field or related industry. These are typically paid positions and must be approved by the department faculty. Saint Leo also offers an academic achievement scholarship for online MBA students. To be competitive for the $6,000 award, students must be new, in their first term, with a 3.25 GPA in their previous undergraduate program. All scholarship candidates must submit an application for which the deadline changes with each term throughout the year. Incoming MBA students may be able to obtain credit for transfer courses, credit by exam, prior learning experiences and military service. The appropriate official documentation must be submitted to the registrar for evaluation. In most cases, up to 6 transfer credits may be applied toward the MBA. Applicants should also submit official transcripts, a resume, 2 letter of recommendation and official GMAT scores. Established in 1974, Concordia University is a public university with over 45,000 students. Offered entirely online and in a hybrid format, its Master of Arts in Human Resource Management helps distance learners acquire the essential financial, critical thinking and leadership skills to pursue upper-level careers in the HR field. The curriculum aligns with the Society of Human Resource Management's (SHRM) guidebooks and curricula templates. Throughout 36 credit hours of study, you will engage in a practical approach to learning HR competencies in today's organizations. The program focuses on preparing you to be a strategic partner within businesses and organizations. You will learn financial and strategic thinking skills and understand how to maximize the return on investment from a company's human capital. The program's course schedule is sequential and completed in a synchronous online format. As an MA student at Concordia, you will explore the foundational and innovative skill sets required by working professionals in the HR field through courses like Human Resources Leadership and Ethics, Research Methods and Design, Finance for Human Resources Leaders and Recruitment, Selection and Retention. All prospective online and hybrid students must complete the standard graduate application. Applicants should have a bachelor's degree with a 3.0 GPA or better. The application should also include official transcripts, a personal statement of 300 words or more and current resume. All distance learners pay a flat-rate tuition except for active military, veterans and their spouses, who receive a substantial discount per credit hour. Founded in 1964, Charleston Southern University is a Baptist college with over 3,700 students. The graduate school offers the Master of Science in Human Resource Management. The degree must be completed in a hybrid format, which follows a regular, synchronous schedule of class meeting times. In-person classes take place 1 night a week from 6-9 p.m. In total, you will complete 11 courses or 33 credit hours for graduation. Throughout the program, you will learn the necessary skills to be an effective leader in the HRM field. Students focus on communication skills, including writing academic papers, completing research projects and developing informational presentations. Core classes such as Staffing, Training and Development and Organizational Behavior cover basic HRM responsibilities. You will also get to choose 4 different electives to tailor your degree to fit your academic needs and career goals. Popular electives for students pursuing the MBA with a HRM concentration include Fundamentals of Leadership, Entrepreneurship, International Business and Trade and Information Systems Concepts. All students must take a pass/fail exit assessment that tests your knowledge and ensures your mastery of the material. A passing mark is required to graduate. Upon graduation, Charleston Southern students are prepared to sit for several professional certification exams, including the exam to become a Certified Professional in Human Resources. Prospective students must complete a standard online application and submit official transcripts, a resume, a 500-word essay/academic statement, GMAT scores and 2 signed letters of recommendation. Incoming graduate students may transfer up to 6 credits toward their MBA as long as they were earned with a "B" or better. All MBA students must complete their degree within 6 years of their oldest Charleston Southern or transfer credit. Belhaven University's Master of Business Administration with a Human Resources Concentration is available entirely online. This master's curriculum aligns with the Society of Human Resource Management (SHRM) and focuses heavily on the study and application of human resource principles. You will explore the standard practices required of human resources professional working in today's modern workforce, including employee relations, compensation and benefits, organizational development and other current challenges in the field. This program includes some cohort learning, wherein you will join your classmates and work on online group projects and activities to enhance the learning process and work on team-player skills. Incoming students may transfer up to 6 hours of accredited graduate work with a "B" or better. You should have a bachelor's degree with a minimum cumulative 2.8 GPA. Your undergraduate transcripts should indicate successful completion of a college algebra or higher mathematics course with a "C" or better. Prospective students who don't meet the standard admission requirements may still be admitted on a conditional basis. In those cases, you must submit an essay and 2 letters of recommendation with your application. In order to remain in the program, those accepted on a conditional basis have to maintain a 3.0 GPA in the first 6 semester hours of graduate work. All required courses are 8 weeks in duration, and you will need 42 credits in total for graduation. Full-time students can often complete this program in 2 years. As a Christian university, Belhaven strives to create enjoyable service-learning opportunities for its students. Distance learners who live close to campus may engage in these activities in-person. Alternatively, Belhaven's spiritual outreach programs include far away distance learners as well. Prospective students who wish to earn an MBA with an HR concentration while actively practicing their faith among a Christian student body may find Belhaven to be a good fit. Founded in 1939, the University of Valley Forge's accelerated online Master of Arts in Organizational Leadership can be completed in as few as 18 months. Through a curriculum of 7-week courses and 33 credit hours, you will acquire the leadership principles and practices that will serve your current employment scenario or maximize your potential for success in the future. This program is structured around teaching leadership skills to effectively lead organizations. This includes understanding the dynamics of global and multicultural environments. You will gain useful day-to-day skills such as budgeting and financial planning, financial management and risk management, decision-making and business strategies, all of which are necessary for success in the HR field. There is a secondary emphasis on communication skills, including writing and presentation skills, that will help you articulate your agenda and strategies while working in the field. As a Christian school, the curriculum is taught with a biblical, Christ-centered worldview. As an MBA master's student, you must complete required program courses such as Effective Organization, Human Resource Leadership, Communications and Marketing, Ethics and Branding and Critical Issues for Leading People. Distance learners must also complete a capstone paper, a culminating project that offers a self-reflective, critical analysis of one's skills acquired through the program and an outline of career plans following graduation. The Student Success and Career Services Center provides 1-on-1 career counseling, mock interviews, career and internship exploration and resume assistance. You don't have to take the GRE or GMAT for admission to the online master's degree program. Central Michigan University is a public research institution, established in 1892, with over 23,000 students. It is one of the nation's 100 largest public universities. Its Master of Business Administration in Human Resource Management degree focuses on making you the vital link between employees and management in virtually any kind of business or human resources scenario. CMU graduates of this program seek out careers as labor relations directors, employee relations managers, payroll managers, recruiting managers, directors of employee benefits, training and development managers and human resource directors. This MBA program requires an extensive set of core business classes, including Data Analysis for Managers, Global Economic Environment, Marketing-Based Management and Managerial Accounting. With a focus on human resources management, you will take 3 courses in that area: Human Resource Management, Employee Selection and Evaluation and Seminar in Organizational Development. Competitive applicants have a bachelor's degree with a 2.7 GPA or higher and GMAT scores of 450 or higher from within the last 5 years. Incoming students are expected to have already taken foundational undergraduate-level courses in economics, statistics, accounting and finance. You don't have to submit GMAT scores if you have a 3.0 GPA or higher in addition to 5 years of work experience in the field. CMU's Online Learning Resource Center can help incoming students prepare for the demands of the online classroom experience. From video tutorials on using the course delivery program, Blackboard, to time management tips, online study tools and technological assistance, this is an invaluable resource for getting the most out of your online education. Lincoln Memorial University is a private 4-year liberal arts institution where online students can earn the Master of Business Administration - Human Resource Management Concentration. This fully online program consists of 36 required credits and features a rigorous curriculum in an asynchronous format. Degree seekers will take courses like Human Resource Management, Marketing Management, International Business and Organizational Leadership. The department prides itself on having a student-centered approach to teaching and strives to foster a comfortable interactive learning environment. With LMU's program, you will study with professors who have real-world business experience and prepare for leadership roles in virtually any position in the human resources field. Under their guidance, you will explore cases studies and participate in group projects, presentations and online class discussions to get the full experience of this MBA program. There are also learning opportunities for you outside of the classroom. In many cases, MBA students offer free business consulting for for-profit and nonprofit businesses in their communities. In addition to pursuing human resources job with businesses and organizations, some LMU students find careers teaching at college and universities as adjunct professors. Prospective students must submit an online application, 500-word essay, professional resume, official transcripts, 3 letters of recommendation and a bachelor's degree with a minimum 2.75 GPA. LMU provides career counseling, career exploration classes and personality assessments to help students locate the right career. The Office of Career Services can also direct recent graduates to open jobs for which they qualify. You can receive help constructing your resume and cover letters in addition to interview preparation instruction. Online students also have access to anonymous online health screenings and counseling. 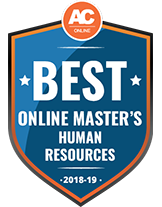 At Davenport University, online students can earn the Master of Business Administration - Human Resource Management Concentration in an online, asynchronous format. Over the span of 39 credit hours in a series of 7-week courses, you will explore the essential systemic and strategic problem-solving strategies for human resources professionals in today's challenging business environment. The curriculum is aligned with the Society of Human Resource Management's education standards and prepares students to sit for the SHRM Certified Professional exam upon graduation. As a business degree, online learners will take 24 credits of business training including courses like Corporate Finance, Managerial Economics, Marketing Strategies and Managerial Accounting. Only 12 credit hours focus on the human resources concentration. From classes in compensation and benefits to organizational development and training, you will learn the foundational knowledge necessary for leadership roles in virtually any human resources or business environment. DU serves those professionals early in their business careers and other working adults who wish to sharpen their professional skills. To save those students time and money, you can earn credit for prior learning experiences and potentially transfer some previously earned credits toward your master's degree. You can even earn your MBA in a 12-month, accelerated format. Prospective students should already hold a bachelor's degree in a business-related field. Applicants who have a 2.75 GPA or above aren't required to take the Foundations of Business courses, which consists of 4 classes that function as undergraduate classes for non-business majors or remedial graduate courses for students with lower GPAs. All MBA degree candidates in the human resources management concentration must complete a capstone project. All degree candidates have access to DU's career services office, tutoring services and online library access to full-text documents, study materials and online course tutorials. The Master of Business Administration in Human Resource Management program at Tiffin University is ideal for online students looking for maximum scheduling flexibility. This private university offers 6 convenient start dates throughout the year to accommodate even the busiest of schedules. For distance learners, there are 2, 7-week terms per semester starting in January, March, May, July, August and October. As an MBA program, you can expect to acquire solid foundational knowledge of business practices, spanning topics from economics and finance to strategic marketing and quantitative analysis. With such courses as Conflict Resolution and Talent Acquisition in the human resources concentration curriculum, you will also explore the theories and practices involved in developing a base of strong, talented employees, learn how to manage business relationships and use strategic human resource policies and practices to provide leadership in your place of employment. This is an accelerated program that full-time students can complete in as few as 14 months. Online students who take classes part-time can expect to spend about 2.5 years completing the degree. Prospective students must have a bachelor's degree with a recommended minimum GPA of 3.0. Incoming students with a 3.0 GPA or higher don't have to take 2 of the entry-level, no-credit business courses: Managerial Business Foundations and Fundamentals of Quantitative Business Models. Transfer credits may be accepted toward your master's degree. A Transfer Admissions Counselor will examine your transcripts and consider any previous academic work with a 2.0 GPA or higher. As an online student at Tiffin, you will also have academic support and career mentoring through the Career Services Office, as well as online technical support and library access. At the University of Texas at Tyler, students can pursue a Master of Science in Human Resource Development entirely online. To be admitted to the program, this public institution requires a bachelor's degree, GMAT scores and official transcripts. Your GPA and tests scores are combined to determine your eligibility. Successful applicants in the recent past have had a GPA x 200 + GMAT = 1,000 or higher. If a student's last 60 hours of bachelor's degree coursework is higher than a 3.25, the GMAT can be waived. This is an asynchronous program wherein students prepare for jobs in business, nonprofit, educational and governmental settings. As a distance learner, you will have the opportunity to explore the purposes, practices and problems commonly encountered in private for-profit and public nonprofit organizations. Online learners also learn how to design, deliver and evaluate effective employee training programs. You will need 36 credit hours to graduate. Up to 9 of those credits may be transferred from other schools and are subject to approval by the coordinator of graduate programs and the Dean of the Soules College of Business. You don't have to complete a master's thesis for graduation. You will have access to 1-on-1 learning support from professors in the department by using the online Canvas system. Through the Academic Success and Advising Center, distance learners can participate in supplemental instructional sessions and tutoring services. Career and professional development services are available online and in-person on campus, as well. The Soules College of Business offers optional graduate internships to bolster your academic resume. Internships require a minimum 3.0 GPA, the completion of at least 9 semester hours and the support from someone on the faculty. Southern Wesleyan University is a private, nonprofit Christian school with about 1,700 students. Located in the Benson School of Business, the Master of Science in Management and Leadership with a concentration in Human Resources teaches distance learners organizational leadership and strategic thinking skills. Upon graduation, you will also be prepared to sit for the Professional in Human Resources certification exam. Master's degree students learn to build organizational cultures in business settings and how to execute well-defined HR strategies that work well in large organizations. As a Christian-affiliated school, the Southern Wesleyan curriculum has a religion-centered perspective on management ethics, collaborative techniques and project development. You will need 36 credits to graduate. Courses are 7 weeks in duration and require about 13-16 hours of work per week. At the end of the program, students may be required to complete a comprehensive exam. Typically full-time students can complete the degree in as few as 24 months. Southern Wesleyan graduates of the MSML in Human Resources program often pursue careers as human resource directors, managers or consultants, benefits managers, compensation specialists or employee recruiting managers. Applicants should have a bachelor's degree with a 2.7 GPA or better. Conditional admission may be granted to those with a lower GPA with an otherwise strong academic record. Prospective students with a GPA lower than 2.5 may take the GMAT to supplement their application. Applications should also include 2 letters of recommendation, official transcripts and contain documentation showing your experience of 1 year or more in the health care field. Southern Wesleyan accepts transfer credits on a case-by-case basis, provided that your previous credit was earned in a master's degree program at an accredited college or university. Wilmington University's Master of Science in Management with a concentration in Human Resources program strives to generate management practitioners with the knowledge and contemporary skills to meet the challenges of today's global organizations. The curriculum is built around leadership skills and problem solving to prepare you for the demanding nature of modern organizational systems. WU students learn to be innovative leaders, transition smoothly throughout times of change and remain competitive in a global environment. The program also explores in detail the complex systems at play in the business world with courses on diversity and culture, creativity, technology and global economies. You will need 36 credits for graduation. While some of the courses are completed in a synchronous format, the majority of your work will be on your own, asynchronous pace. All students will spend 2 course credits completing an independent study project that demonstrates their mastery of course material. WU's flexible elective credits allow students to take courses from other departments to help tailor their degrees to fit their academic interests. An academic adviser must approve all modifications to the traditional curriculum. By completing an additional 6 graduate credits at WU, master's students can earn professional certifications. Popular certifications for students in this program include Certified Production and Inventory Manager, Certified Financial Planner, Certified Project Manager and Senior Professional HR Manager. Prospective students must have a baccalaureate degree and submit official transcripts with the standard graduate application. To advance to degree candidacy, you must complete 4 courses with a minimum 3.0 GPA, attend a program planning conference and pass the management course MGT 6501. The GRE isn't required for admission. At Rutgers-New Brunswick, a public research institution, distance learners can earn a Master of Human Resource Management degree in a hybrid format. This program boasts a curriculum that explores strategic human resource management, global employment strategies, new approaches to worker involvement and the transformation of work. You will learn about present-day skills that will be helpful for in leadership roles in virtually any business in the U.S. by completing courses like Economics and Demographics, Financial Fundamentals, Employment Law and Developing Human Capital. The majority of the classes in this program must be completed on-campus. Courses such as Human Resources Strategies, Financial Decisions in HR, directed study electives, internships, independent study courses and master's thesis preparation can be completed remotely. Prospective students must have a 3.0 GPA or higher. Applications must also include 3 letters of recommendation, official transcripts, professional resume and a personal statement describing how you will fit and contribute to the master's program at Rutgers. The GRE is also required, with a score in the 50th percentile in both the verbal and quantitative sections and a 4.5 in writing. The GMAT may be taken in place of the GRE, for which a score in the 50th percentile is also required. Online students have access to Rutgers' career services, online tutoring and academic counseling. Financial aid is also available for students pursuing this hybrid degree. There are 5 different scholarships available through the department, the School of Management and Labor Relations, which are reserved for HR students. Incoming students may be able to transfer up to 18 credits from their undergraduate program depending on the curriculum. In addition to an original master's thesis, you will need 48 credits for graduation. Full-time students can typically complete this degree in 2-3 years. Tarleton State University is a public state university with over 12,000 students and is part of the Texas A&M University System. In this Master of Science in Human Resource Strategic Management program, you will have the chance to develop skills in areas of the HR field such as candidate recruitment and selection, employee training and development, compensation and benefits, labor relations and organizational effectiveness. Distance learners are equipped with the skills and knowledge to be business leaders through training and courses like Strategic Human Resources, Laws and Regulations in Human Resources, Organizational Behavior and Global Human Resource Management Practices. Graduates of Tarleton State typically seek out employment as general and operations managers, human resource managers, management analysts and administrative service managers. Toward the end of your degree program, you must pass a comprehensive exam. The exam ensures that students leave the program able to apply theory and concepts in business situations effectively. All students must display mastery in the functional areas of the HR field to be eligible for graduation. Tarleton State is affiliated with the Society for Human Resource Management which offers additional professional development, leadership and scholarship opportunities, as well as social and civic events for students studying human resources. Applicants with a GPA below 3.0 must submit GRE scores. Applications should also include an essay stating why you would be a good fit for Tarleton State. Admission is rolling, but for priority consideration, you should apply at least 1 month prior to the start of classes. Fitchburg State University's Master of Business Administration in Human Resources Management degree focuses on participatory learning, involving all distance learners in online class discussions and collaborative learning groups. Degree seekers at FSU must complete 30 credit hours to earn this MBA. Of the total credits, 18 hours cover advanced core concepts in business and 9 satisfy the human resources requirements. In the core curriculum, with courses like Organizational Behavior and Development and Corporate Finance, you will acquire foundational knowledge in business and management. The human resources concentration consists of three courses: Human Resource Function and the Manager, Legal Issues in Human Resources Management, and Selected Topics in Management. Online learners can begin their program at any of the 8 starting dates, provided they meet the appropriate application deadline. Depending on your workload and availability, in addition to the timeline and availability of required courses, a full-time student can complete this degree in as few as 12 months. Applicants should have a bachelor's degree with a minimum 2.0 GPA. Applications must also include official transcripts from all previously attended colleges and universities and a professional resume. Prospective students who have GPAs of 2.8 or lower may submit supplemental letters of recommendation or proof of professional work experience in the field. Online students pay in-state tuition rates no matter their current location. You will also have access to online library services, 24/7 technical support, academic advisors and curriculum coordinators to help you configure a course schedule that fits your needs. Transfer credits may be accepted toward your degree but must be evaluated by the registrar on an individual basis. Troy University is a public institution with over 18,000 students. Distance learners can take advantage of Troy's accelerated Master of Science in Human Resource Strategic Management degree and graduate in 1 year. This 30-credit hour, 10-course program focuses on global perspectives and business frameworks. This degree is nonresearch-based and designed to provide distance learners and working professionals the opportunity to gain an understanding of the subject matter, enhance their career opportunities and increase their earning potential. You will take courses covering topics like staff training and development, employee relations, compensations and benefits and strategic management. Accepted applicants may be granted unconditional or conditional admission. In addition to having a GRE score of 1050 and GMAT of 500 or above, unconditional admission is granted to students who already have a master's degree or a bachelor's degree with a minimum 2.5 GPA. Those with a 3.0 GPA in their last 30 semester hours don't have to submit GMAT or GRE scores. Applicants with less than a 3.0 GPA in a previous graduate program may be granted conditional admission. In most cases, incoming students may transfer a maximum of 2 graduate courses, or 6 credits, toward their master's degree. To graduate, all students must complete 33 semester hours with a 3.0 GPA within 8 years of enrolling. Students in the military receive about a 50% tuition discount. Their spouses and dependents can also receive a discount between 25-50%. There are 5, 9-week terms per year. Distance learners may begin courses at any term as long as they meet the application deadline assigned for each term. Opened in 1966, Bellevue University is a private nonprofit institution with over 10,000 students. With this Master of Science in Human Resource Strategic Management degree, you will learn to meet the demands of today's dynamic and diverse workplaces with creative problem-solving, data-driven decision making, empathy and industry standard ethics. This is a cohort-learning degree wherein you take synchronous courses one at a time with the same group of online peers. After analyzing a real business or organization and conducting in-depth field research, students develop a strategic plan for a human resources department for the culminating capstone project. The capstone project illustrates the skills you have earned throughout your time at BU and demonstrates your abilities to serve the professional world. BU students train to be strategic business partners that serve and support their institutions by studying legal and ethical issues, diversity in the workforce, metrics and evaluation and HR organization. Upon graduation from BU, you will understand employment law and standard industry practices for HR leaders in the field. Graduates will also be able to develop professional development plans and demonstrate proficiency in oral and written communication. Using BU's secure online classroom, Cyber-Active, you will engage with experienced faculty, classmates, and use multimedia tools to view lectures, demonstrations and assignments. Online tutorial videos and academic tutoring is available and tech support can be accessed 24/7. In addition to having a bachelor's degree from a regionally accredited college or university, applicants should have a 2.5 GPA or higher. The GRE is not required for admission. To graduate, master's students must pass all degree-required courses with a "C" or better and maintain an overall 3.0 GPA. This 30-credit degree can be completed in about 2 years. Established in 1891, the University of Wisconsin-Stout is a public university with more than 9,500 students and 16 online graduate programs. This online Master of Science in Training and Human Resource Development teaches distance learners the skills to implement learning projects for employees and organizations while holding leadership positions. You will learn how to facilitate strategic planning for change, manage stakeholders and leverage diversity in various business contexts. Graduates of UW-Stout often seek out work as leadership development specialists, development managers, technical trainers and human resource development coordinators in a plethora of professional situations. Applicants must have a bachelor's degree from an accredited university with a minimum 3.0 GPA. A background in training systems and organizational leadership is also required. Applications must include a resume, cover letter and a professional development plan with short- and long-term career goals. This 30-credit degree typically takes full-time student 2 years to complete. Many UW-Stout students take on paid graduate assistantships to gain valuable professional experience while completing coursework. The positions generally are on a yearly basis, although some will be for 1 semester or partial semesters. Workers in these positions are eligible for health benefits if they work 0.33 FTE. Transfer credits may be counted toward this degree provided they were earned in a related field at an accredited master's program. Distance learners have access to free online tutoring and writing labs where you can get constructive feedback on your school papers in as little as 24 hours. UW-Stout has a partnership with the Southeastern Wisconsin Chapter of the Association for Talent Development. Therefore, in addition to online tutoring, counseling and career services, online students are able to get further training and professional development through this organization. Western Carolina University is a public institution with an online Master of Science in Human Resources degree. This program is specifically designed to meet the needs of working professionals who wish to advance their careers in the HR field. With this 36-credit hour program, you can prepare for leadership positions and increase your earning potential. You will learn to apply evidence-based practices and theories centered around WCU's 4-part competency model: strategic, ethical and socially responsible, operational and relational leadership. The curriculum consists of 7 required major courses and 5 electives. MSHR learners take foundational and innovative major and elective courses, such as Coaching for Performance, Organization Acumen for HR Leaders and Talent Development. Applicants should have an undergraduate degree with a 3.0 GPA or higher. GRE scores and 3 letters of recommendation are also required. Most part-time students complete this degree in as few as 2 years by taking 2 classes per semester, including summers. Incoming students may transfer up to 6 semester hours, provided they earned them in a master's degree program at a fully accredited university. Those applicants with 5 years of full-time HR experience have extra flexibility when choosing their elective courses. WCU's Career Services Center provides many services and events to help students locate employment upon graduation. Distance learners are also welcome to participate in the HR Consulting Initiate, a not-for-profit group that offers members of the center pro bono expertise on human resource topics and issues. Since 2011, over 600 MSHR students have worked with the program to help small and mid-sized not-for-profits like animal shelters, arts programs and youth organizations. Utah State University has a growing list of online programs and has been offering distance learning options for over 20 years. All of the online programs are meant to fit around the busy schedules of working adults. Its Master of Human Resources is designed for current human resources workers who are looking to advance their career within the field. The amount of time it takes to earn the Master of Human Resources varies. For students studying full time, the program can be completed in as little as 12 months. For part time students that are working while earning their degree, USU estimates that the program will take 24 months. However, it may take longer for some students because of the program's prerequisites. To enter the program, students need to have a bachelor's degree in a business related field. Any student that doesn't have this type of degree will be required to complete 10.5 credits of business core prior to beginning the master's program. These courses are offered entirely online and are available in an accelerated format, but they will add to the total cost of the program. In total, 33 or 43.5 credits will be required, depending on whether the student needs to take these business courses. All of the courses for this program are available entirely online. Students that live in Utah will not be allowed to enter the online program, though, and will be required to study on campus. Any students outside the state are eligible for the program. Operating as a private college based in California, National University maintains multiple campuses throughout the state as well as one campus in Nevada and a flourishing distance learning program. The school's online program provides a master of arts in human resource management that maintains accreditation through the Society for Human Resource Management. Having recently undergone a curriculum review, NU's plan of study incorporates 21st century methodologies and theoretical frameworks to create a cutting-edge program. The program requires at minimum 54 quarter credits, but learners can transfer up to 13.5 credits from another graduate program at the time of enrollment if they so choose. All told, degree seekers complete 12 credits in areas of compensation and benefits, advanced studies in organizational behavior and integrating performance management tactics. All students either complete a comprehensive project or write a thesis as part of graduation requirements. Although not required, students can elect to complete a specialization in organizational management. As a private institution, National University charges $430 per quarter unit at the graduate level. After graduating, alumni have gone on to roles as employee trainers, internal/external consultants, compensation and benefits managers, risk managers and employer relations specialists. While at NU, distance learners benefit from academic advising, career support, resume reviews, technical assistance, and disability services. They may also qualify for an institutional scholarship (the department currently offers none) if they meet the requirements for academic merit and/or financial need. From its home base in Terre Haute, Indiana State University educates nearly 13,000 students annually and makes itself known in the higher education space through cutting edge research. The institution offers an online master of science in human resource development for both existing HR specialists looking to further their careers and those looking to move into a new type of work. Upon leaving Indiana State, graduates move into roles as HR consultants, HR directors, training facilitators, executive recruiters and chief learning officers. ISU's degree consists of 33 to 36 credits depending on electives. Most learners finish the program in 18 months, although part-time options also exist. Regardless of the path chosen, all students must finish the degree within 7 years of enrollment. Some of the core courses include systematic design of human resource development programs, international and cross cultural teaching and leadership in human resource development. Learners must also decide whether they want to complete an interactive capstone or research and write a master's thesis. Regardless of the path chosen, all degree seekers must complete an occupational internship â€“ either with their current employer or an approved organization. Because all classes exist fully online, students are never required to visit campus. When applying to ISU's program, learners should hold a bachelor's degree from a regionally accredited school and a GPA of 3.0 or higher. GRE scores are not required. Residents pay $412 per credit while non-residents pay $527. The school awards more than $16 million in scholarships and awards each year, so students should speak with their financial aid adviser to learn about funding options. A member of the Nebraska State College System, Chadron State College provides education to 3,000 online and on-campus degree seekers each year. The master of science in organizational management is offered entirely through distance learning and requires students to complete 36 credits. Full-time degree-seekers typically finish the program in 18 months while those taking classes on a part-time basis usually need 24 to 30 months. To begin, distance learners take 6 credits in research and methodology courses to give them a firm footing for the coursework that follows. The following 12 credits focus on organizational management and leadership topics such as human capital management, high performance leadership and advanced organizational psychology. Individuals wanting to further specialize their knowledge can complete additional hours in focus areas such as human services, natural resources or sports management. To round out their time in the program, degree seekers choose from 3 options: a 6 credit internship, a 3-credit internship and scholarly project or a 6-credit class requiring them to research and write a thesis. To help learners who want to graduate more quickly, some classes may be offered in 8-week sessions. Regardless of location, all online students pay the same tuition rate of $361.25 per credit. In addition to academic advising and resources, students seeking technical assistance can take advantage of a 24/7 helpline for sorting out issues. Applicants don't need to submit GRE scores but they do need a GPA of 2.75 or higher from a regionally accredited college or university. An online master’s degree program in HR teaches students how to handle a wide range of responsibilities, including how to manage employees and handle workplace disputes. Students also learn how to establish benefit and wage packages as well as handle the hiring and recruitment of employees. Students can expect the same material covered in a traditional HR master’s program to be explored in an online HR master’s program. What’s the difference between a master’s in human resources and an MBA in human resources? There are a few key differences between a master’s degree in HR and an MBA in HR. Both provide the training needed to attain higher-level management human resource roles in organizations. However, an MBA goes beyond human resources to also touch on general business topics, such as marketing, operations, strategy, accounting and finance. Therefore, it may be a good option for someone who wishes to pursue business positions in the future along with human resource roles. Meanwhile, a master’s degree in HR places more focus on the management of human resources. It is most appropriate for someone who prefers to remain in human resources, acting as his or her company’s strategic partner and internal consultant. Both programs can take about one to two years to complete, although they may take longer—between three and four years—for those who complete it part-time. What common courses are offered in a master’s in Human Resources program? Check out these five sample courses you might be required to take as part of an online HR master’s degree program. In this course, students learn about both team and individual behavior in companies and how this behavior impacts effectiveness. This class prepares students for careers in business negotiations, training/development and conflict resolution. This course enables students to analyze institutional theoretical and neoclassical economic perspectives on labor policies and wage determination. Students also explore labor supply and demand as well as labor markets. Through this course, students examine the workplace diversity, race and gender challenges that face employees and employers. Students also gain skills related to the management of diversity. In this course, students learn about the normative elements related to ethical decision-making. They also explore descriptive ethics, a growing area of interest among human resource managers. This course allows students to study the theory behind staffing in organizations. They also focus on training and staffing practices in the modern-day workplace. In a master’s degree in HR program, students may take part in on-campus intensive courses over the course of a few days. The immersion experience gives students the chance to dig deep into talent acquisition, mediation and negotiation, and global human resources. During this time, students have the chance to network, collaborate and interact with their faculty and peers. In addition, a capstone project may be required at the end of the program. With this project, students might have to explore a certain business challenge in their organizations and figure out how to address it in the human resource context. Rather than requiring students to complete a project, some schools require students to complete a thesis, internship or paper as their capstone project. What specializations are available in a master’s in HR program? Some online master’s degree programs in HR provide students with the opportunity to specialize in a certain aspect of the field. For starters, students may choose between a Master of Science in HR and a Master of Arts in HR. The former focuses more on the technical side of human resources, whereas the curriculum of the latter includes liberal arts studies. In addition, many programs allow students to concentrate on areas such as labor law, collective bargaining, staffing/training/development or employee benefits. Other online master’s degree in HR programs allow students to focus on one of a variety of business environments as a concentration, such as international business, finance or accounting, making these programs similar to an MBA in HR program yet still heavier on the HR side. This specialization covers employee regulations, legal and illegal business practices and human rights. In this specialization, students analyze labor unions/organizations in the United States. They learn how they are structured, governed and administered as they strive to achieve their political, social and economic objectives. This specialization allows students to examine the benefits programs that employers use to meet their employees’ welfare needs. Students learn how develop and manage compensation systems for employees. An online master’s degree in HR will provide you with the skills you need to succeed in various industry job positions. Take a look at a few of them here. These professionals are responsible for overseeing employee relations, with a focus on hiring, recruiting and interviewing employees. These individuals also take part in conflict resolution, training and compensation duties. A master’s degree specialization in benefits/compensation can prepare a student for this role. These professionals create, implement and evaluate training programs. They also oversee the performance of employees and develop special programs aimed at helping their organizations to overcome deficiencies or issues. A master’s degree specialization in staffing, training and development can prepare a student for this role. These professionals are responsible for coming up with strategies for best using their companies’ finances in the areas of employee insurance, compensation and benefits. They also create and administer company training programs. A master’s degree specialization in benefits/compensation or labor law can prepare a student for this role. These professionals are tasked with the coordination, monitoring and evaluation of employees’ wages. They additionally oversee retirement plans, such as 401K, commuter subsidies and health insurance coverage. A master’s degree specialization in benefits/compensation can prepare a student for this role. In addition to completing an online master’s degree in HR, students may benefit from joining professional organizations to network with others in the field. Here are a few top ones from which to choose. HRPA serves as an advocate for the human resources profession. It works to advance its members’ careers and to make sure that human resource practices meet standardized and ethical guidelines. NHRA provides training opportunities. It also gives human resource professionals access to career support and networking programs. SHRM is the biggest professional human resource society in the world. The organization offers its members training opportunities and access to events in the industry. It also administers the SHRM-CP certification for individuals who would like to distinguish themselves in the industry by becoming certified professionals. Here is a glimpse at median salaries for human resources career. Keep in mind that some of these positions may require additional experience or certification, in addition to a master’s degree in HR. As indicated in the above chart, human resource professionals are expected to be in high demand over the next decade. They are needed to deal with today’s increasingly complicated benefit options and employment laws. Also, continuing education is required throughout your career in HR, driving the demand for training specialists/managers. Note that a difference in salary does exist depending on your degree. The median salary for a professional with a master’s degree in HR is $75,000, whereas the median salary for a professional with a bachelor’s degree in HR is $58,000. Therefore, if you choose to earn a master’s degree in HR, you can expect to earn about $17,000 more a year. Students who want to improve their job prospects in human resources should seek out institutions that are regionally or nationally accredited, as employers often regard them as more reputable. No national accreditation exists specifically for online master’s degree in HR programs. However, the Human Resources Certification Institute and the Society for Human Resource Management—which offer industry certifications to human resource professionals (the Professional in Human Resources [PHR] and the Society for Human Resource Management – Certified Professional [SHRM-CP] respectively)—both recognize HR master’s degree programs across the United States. Therefore, students interested in completing graduate coursework in human resources may want to choose a school that is recognized by either of these organizations. In many situations, students in a master’s degree program in HR could use some help covering the cost of their graduate schooling. Although loans are available through the federal government, financial aid is also available in the form of scholarships. Here are a few scholarship options for those studying HR at the master’s degree level. This scholarship is available through the Dallas HR Association. Valued at $2,000, the scholarship is designed for graduate students planning to enter the field of human resource management. Students must have a grade point average of 3.0, attend an accredited school, and take part in the college’s SHRM chapter to qualify. This scholarship is available through the New England Human Resources Association. It is awarded each year for $3,000. Full-time graduate students studying HR management at a New England accredited university are eligible to apply. This scholarship is available for $1,000 each year to two students. Graduate students who are pursuing a degree in an area such as labor relations, personnel management or HR management can apply. They must be residents of New Jersey and be enrolled in a Garden State institution. All graduate students should fill out the Free Application for Federal Student Aid (FAFSA). Students can learn more about financial aid in graduate school from our financial aid guide.